While surfing the net over the last few days I came across some amazing artwork that I thought I'd share with you. First is this art where real people and objects are painted as though they were in a painting. There's an article on the artist here where you can see more examples of her work. It's really quite amazing and it's taken me a bit to wrap my head around but I think I like it. I especially like this piece. More of Alexa Meade's work can be seen here. I also found some amazing hyperrealistic paintings where the artist attempts to capture the image in better-than-photographic quality. Honestly, some of these paintings look like real life - it's hard to believe that they're paintings! 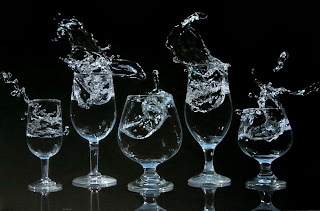 Jason de Graaf's captures glass, marble, and foil in an exquisite way... these look real, not like paintings at all. See more of his work on his site. Gregory Thielker paints a lot of views through rain-soaked windows. They're beautiful and interesting; see them all, including Vortex, here. water distorts the buildings and trees. It feels like summer when I look at many of the gorgeous paintings by Eric Zener. He has been painting for a while and has lots of water-related subjects. They'ere well-worth looking at on his site. And then there are some really gorgeous tempera paintings. Tempera is the medium artists have been painting in for centuries, and was the only medium available before oil painting was discovered. Pigment paint is mixed with egg yolk and a little bit of water and applied with a very small brush to a prepared panel. The paint dries fast so light colours can be painted over dark without getting any muddiness, but it also means that the paint cannot be blended. The Society of Tempera Painters has some instruction and demonstrations on how to do tempera painting in the Technical section of their site. I lack the $30K to buy this one, but I love it. Tom Forrestall has been painting for years. His paintings feel real and they have an impressionistic quality to them. His work is viewable on his website. Tempera artist Mary Frances Dondelinger does amazingly detailed work. I love the series "A Visual Guide to Personal Boundaries" most of all, but all of her work is lovely. of cooperation as a balanced tug-of-war. Modern art doesn't have to be awful, as you can see. I love that painting is still an art form and that it hasn't been superseded by photography or digital art. Of course photography and digital art have their place, too, but I would be unhappy to see more traditional art forms like painting go away. Posted by Chantelle at 10:18 p.m. Thanks Chantelle for your kind words about my work. You might find it interesting that my parents are the hand models for the "Boundaries" series. And such great models they are! Thanks for supporting the arts on your blog.